Is Branding the Way to TAKE YOUR BUSINESS TO THE NEXT LEVEL? 6 Methods for Building BETTER EMAIL LISTS WHY DOESN'T TRAINING WORK for You? 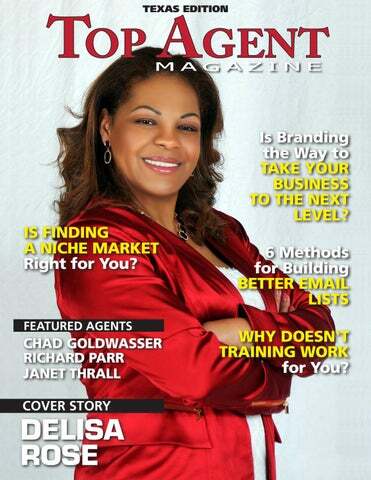 For more information about DeLisa Rose, visit her website at delisarose.com, call 469-404-7378 or email info@delisarose.com www. CHAD GOLDWASSER Chad Goldwasser bought his first house at the age of 22. At the time he was working as a bar and restaurant manager in Austin, Texas. “I decided after working until four or five in the morning sometimes that it wasn’t what I really wanted to do,” says Chad. “I decided at 24 years old that I was going to start investing in real estate.” In order to understand the market better, Chad went on to get his Realtor’s license, and he has been selling real estate for the past nineteen years in Austin. 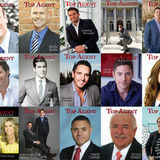 When Chad first began working in the real estate business he worked on a team as a buyer’s agent. After being mentored by an agent, Chad would go on to build his own team. “I was with Re/ Max for seven years, Keller Williams for four years, and in 2008 I launched my own brokerage,” he says. Chad serves the entirety of the Austin metro area, including Round Rock, Georgetown, Pflugerville, Cedar Park, Lakeway, and Dripping Springs. For Chad, his favorite part about being a Realtor is getting to help people. “I love helping my clients get the best deal on their property. I love giving them an amazing experience,” he says. Chad knows that the buying and selling process can be challenging, which is why he works hard to offer his clients unparalleled service to ease them through the transaction. Giving back to the community is important for Chad. He is part of an organization called Black Fret which benefits the music community in Austin. “We have events all throughout the year, and at the end of the year we give away $10,000 grants to different bands,” says Chad. In his spare time, Chad loves running, riding his mountain bike, going to concerts, and spending time with his three children. In the future Chad looks forward to continued success as he grows and expands his business. Chad wants people to know that the success of his business is largely in part to his team’s positive attitude and their dedication to going above and beyond for his clients. What sets Chad apart from other agents is his years of experience working to finesse a system to get his clients the best deal on their property. “I learned from a great mentor,” says Chad. “I learned about the power of positivity and energy and being systematic.” Chad teaches everyone on his team his proven system, making sure to specifically tailor their service to the individual client’s needs. Chad has a high volume of repeat and referral business. He credits his client loyalty to his years of experience, his ability to get clients the best price, his expert level of service, and his professionalism. Clients also remember Chad for his ability to connect with them and have a fun, positive relationship throughout the whole process. Chad stays in touch with his clients with phone calls as well as with personal notes. “Every single year I do an event that I’ve been putting on for fourteen years called Rock and Restock, which is a benefit for the food bank here in town,” says Chad. “It’s a big concert, I’m very passionate about music, and I invite all my clients to it. Last year the benefit raised $27,000 for the Capital Area Food Bank.” Chad pre-markets all of his properties. “We prepare the property through staging, and pre-inspection of the property,” says Chad. The property is then listed on a Thursday morning so it’s a new listing for the weekend. Two open houses occur during the weekend on Saturdays and Sundays. Chad also uses full color flyers, virtual tours, and has a massive online presence. To learn more about Chad Goldwasser call 512-750-8333, email chad@chadgoldwasserrealty.com, or visit puregoldrealty.com www. to your social media presence, should all line up and reinforce your brand. It’s that repetitiveness that will hammer home the perception you are trying to create. Your brand informs your marketing, while your marketing strengthens your brand. Of course then you have to do is make sure your service lives up to what you’re selling. Getting them in the door is one thing, but you’re in it for lifetime customers and referrals. Every brand is strengthened when it is built on a foundation of integrity and trust. RICHARD PARR Buying or selling real estate can be one of life’s most stressful experiences for clients, unless they’re working with someone who makes it fun. Add to that someone who loves working hard to help people achieve their dreams, and you’ve got Richard Parr. JANET THRALL A former Vice President of what is now Macy’s department stores, Janet Thrall of Nathan Grace Real Estate in Frisco, Texas possesses a deep understanding of what customer service entails, and has parlayed that experience into a thriving, 20-year career in the highly competitive real estate industry. Corporate relocation is a large portion of Janet’s business. “When I was in California,” she says, “I was fortunate to get the Toyota account for relocation and I helped move their top executives around and have been working with them as they move into this area as well.” Going above and beyond as always, Janet says “I help them find their churches, their country clubs, their dry cleaners and even their grocery store. For me, it’s not just about helping them acquire a home, it’s about helping them fit into the community. I truly offer concierge service.” Janet also feels compelled to give back to her community and to that end she works with Exodus, a non-profit located in Dallas which provides support for women released from incarceration. “Exodus helps these women learn to live in the outside world: how to budget, be a parent, and get a job. The typical recidivism rate for women is 60%, but those helped by Exodus have only a 20% rate. It’s just a wonderful organization.” For Janet, her primary satisfaction comes less from her stellar sales and more from the interactions she has with her clients. “I like working with people. I can live vicariously through them, and learn about different lifestyles, different cultures.” “That’s a real treat for me,” she says. To learn more about how Janet Thrall can help you with your real estate needs, please call 214-724-4041, email Janetinc@att.net or go to JanetThrallRealEstate.com www.